Can anyone explain why so many high profile companies are having financial problems? Is there cause to worry about economic stability? I first started really paying attention to the spate of emerging problems when Carillion collapsed, the second largest UK construction firm. Watching some of the social media commentators that have an interest in the credit insurance sector. Since then there seem to have been numerous CVAs (Creditors' Voluntary Arrangement), significant losses and proposed restructurings within the restaurant and retail sectors, amongst other. Since the beginning of 2018 "retailageddon" seems to have sped up. Toys R Us saw their CVA collapse into Administration. Byron Burger, Jamie's Italian and Prezzo have all gone into CVA. Following that, Jamies Italian went into Administration (where an insolvency practitioner is appointed to oversee the running of a company that cannot pay its creditors as they fall due). House of Fraser are apparently using a firm of advisers to draw up a turnaround plan, Debenhams have experienced an 84% plunge in profits and HSS Hire (tool hire company) have experienced huge losses. Carpetright are apparantly also considering a CVA. I was talking to someone only yesterday that was oblivious to the growing list of high profile companies that are having problems, but they said that in their own small way that had stopped eating out recently, and only ever used these kinds of restaurant chains when they had cheap offers available. However, the problem doesn't just stop at restaurant chains that could be considered luxury spending. Many of these situations are leading to branches being closed and jobs being lost. This will surely have a negative effect on the economy, more people unemployed and spending less - lower revenues to landlords. We are told that inflation fell to its lowest level in a year, 2.5% in March 2018 but to the man on the street, if feels like prices are spiralling upwards. Gas and electricity "discounts" seems less available, and prices are due to be hiked up again soon as wholesale prices rise. Petrol seems to be gradually climbing nearer and nearer to the levels where we had petrol blockades by trucking companies not so long ago. The cost of basic groceries seems to push relentlessly onwards and upwards. GDP (Gross Domestic Product - a measure of how much the UK economy has grown) according to the Office for National Statistics "UK gross domestic product (GDP) in volume terms was estimated to have increased by 0.4% between Quarter 3 (July to Sept) and Quarter 4 (Oct to Dec) 2017; this is a 0.1 percentage point revision down from the preliminary estimate of GDP". Despite this, growth is still expected for the coming year at around 1.6% according to The Guardian (23/04/18). Sure Brexit fears are always going to be part of the mix, but some degree of growth in the medium terms still seems to be predicted despite this. So what is happening? Is it just austerity causing consumers to cut luxury spending, is this just less well adapted companies being weeded out by economic natural selection, whilst the likes of Amazon capitalise on the greater move towards online purchasing? Or is something more worrying happening? 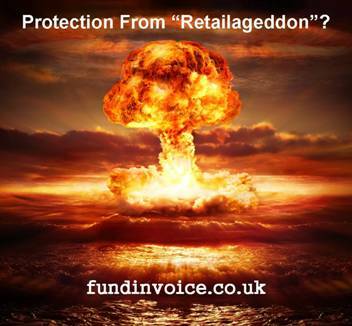 We are doing our best to protect our clients from the potential fallout from large company failures, but I continue to worry about just how much more we can expect from Retailageddon.